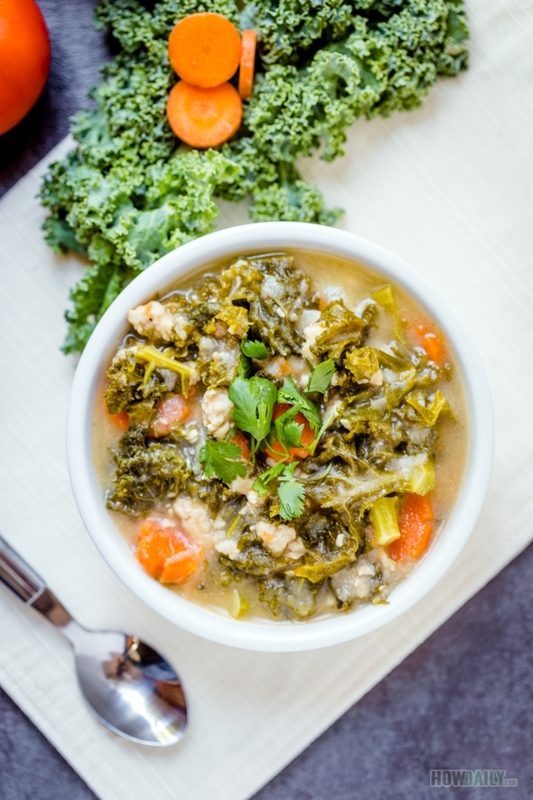 Kale is known as one of the super food that start appearing on the table more and more this year. Its healthy vitamin, full fibers and antioxidant nature would give anyone benefits, either for preventing disease or body cleansing, skin firming, etc. Apart from these health benefit, another reason is due to its hardiness. It’s a hardy tough vegetable that will survive the frost and remain intact for the winter. In fact, Kale is even tastier after being chilled under icy cold temperature, which make it one of the best winter veggie to look out for. 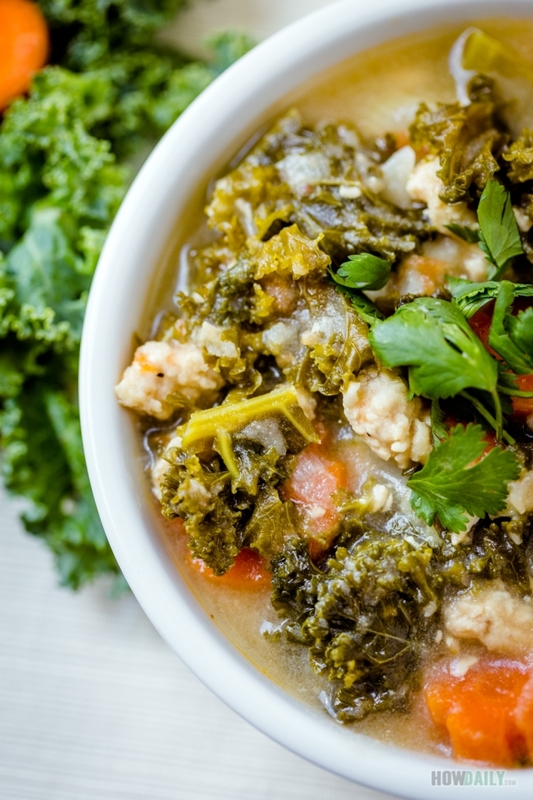 Kale is great for salad, crispy baked kale chips, blend into healthy smoothie and last but not least, you can toss it into a boiling pot for soup to add extra burst of colors, vitamins and nutrition. 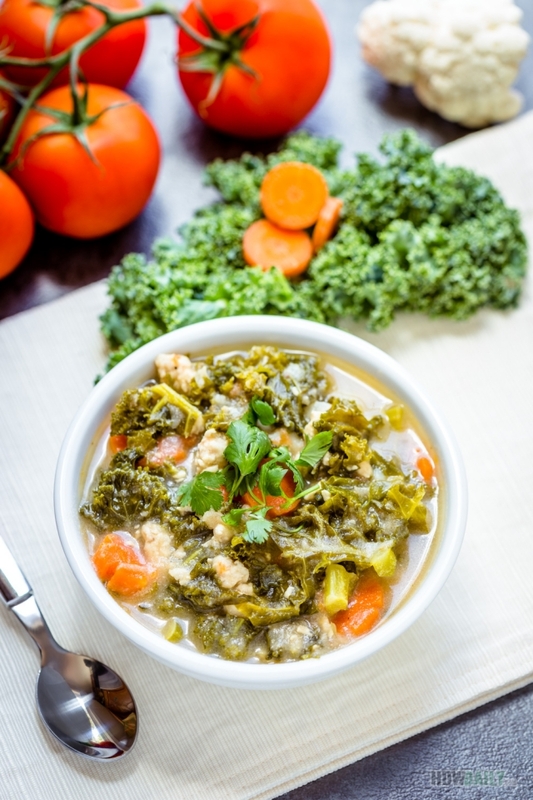 Any other vegetable would work to accompany this soup. Carrots and tomatoes are there for their nutritious values plus their beautiful vibrant colors. Cauliflower make the soup more creamy and thicker, true, no one would like their soup to be too runny, even for a healthy Paleo soup. 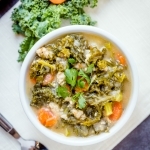 This Kale soup is a great quick lunch for you, just chop the ingredients and throw into the pot, let it simmer in a crock pot or something and go on to your other works. Don’t forget the chicken broth going into it, the taste will be delicious and the scent is what we’re all going to sniff after. For variation, substitute the veggies for one another. You could also use ground turkey instead of chicken or lean ground beef. The taste remains perfect though. Add a few leafy green, cilantro and other herbs to vary the taste. I like mine season with some parsley though. Spray some avocado oil in saucepan over high heat. Add crushed and diced shallot and stir till soften and giving off aroma. Add ground chicken, stir till golden then add chop carrot and diced tomatoes. Add the chicken stock, wait until boil, then reduce heat to medium. When veggies are soft enough, stir in the Kale and grind cauliflower. Reduce heat to simmering, cover and cook for 20 minutes.